Only one way to capture the attention of an audience: give them a personal look at one character’s struggle with conflict. Leave this important passageway undefined and an Author risks disinterest and disdain. In this series on Conflict, the focus has stayed on a holistic understanding of story structure. Regardless of the type of story, each throughline—Overall Story, Main Character, Influence Character and Relationship Story—received an equal and appropriate amount of attention. Yet in doing so one throughline in particular, the most important in terms of capturing the attention of an audience, managed to escape the analysis with one important aspect overlooked. Main Characters can suffer from deficient ways of thinking, like Red in The Shawshank Redemption and Hamlet in Hamlet (as covered in Exotic Story Structure Often Unexplored). Others can face challenges with their physicality or their station in life (Wikus Van De Merwe in District 9 or Mike Flaherty in Win Win). Still other Main Characters combat difficult or troublesome attitudes (Theo in Children of Men or Amelie in Amelie ). This leaves one area of conflict unexplored: those Main Characters beset by problems of activities. Recognizing stories where every character engages in difficult activities (Rebels vs. The Empire in Star Wars and Destroying the Ring in The Lord of the Rings) and stories where individual relationships focus on the same (Lester and Ricky in American Beauty), stories that focus the problematic activity on the most personal of throughlines take on a different personality. William Wallace in Braveheart, Woody in the first Toy Story, and Hogarth in The Iron Giant serve as excellent examples of Main Characters who face trouble because of what they do. Wallace finds conflict not in the way he appears (Situation), not in what he thinks (Fixed Attitude) or even how he thinks (Psychology), but rather in the things he does (Activities). Seeking revenge on his wife’s murderer, plundering English forts and stepping in where few dare to tread—Wallace creates trouble for himself because of the actions he takes. Same with Hogarth Hughes in The Iron Giant. His sense of adventure and his natural desire to collect stray creatures (both organic and mineral) defines his character and the type of conflict the audience can expect from his personal Throughline. That optimistic drive to do? That’s Hogarth through and through. 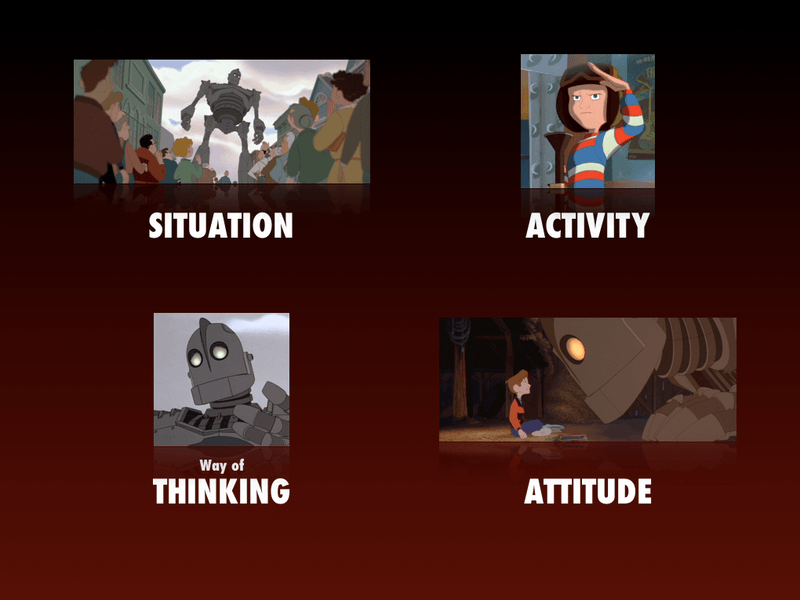 Understanding that the Influence Character’s Throughline sits directly across from the Main Character on the structural chart puts the Iron Giant himself in a Problematic Way of Thinking or deficient psychology. Locked in a constant struggle of who he is and what he should be, the Giant reflects Hogarth’s adventurous spirit in his own internal quest. The two bounce off each other—one external, one internal—until the end, when the Giant must finally take that step into the external and finally take some action. But what about those Main Characters who suffer from a lack of action? Why Won’t Anyone Play With Me? 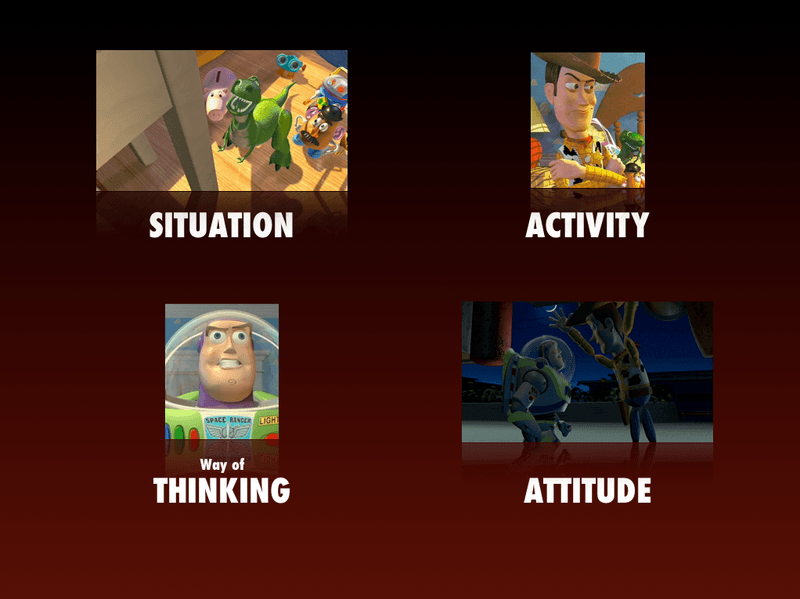 Woody’s throughline offers an excellent opportunity to expand on this idea of areas of conflict within a story. Unlike Wallace and Hogarth, it’s not so much the things Woody does that creates problems for him (though he does tend to jump into things quickly, calling meetings, getting into fights, etc. ), as it is the lack of someone playing with him. An interesting facet of these areas of conflict lies in the fact that they can either be problems engaged in or problems attributed to the Throughline in question. Remember that a Main Character in the Fixed Attitude corner of the structural chart can either suffer from a bad mindset (Scrooge in A Christmas Carol) or have others think badly of him (William Munny in Unforgiven). Either way satisfies the definition of a conflict stemming from problematic mindsets. Again, it is the purpose behind the throughline that is more important than its portrayal. 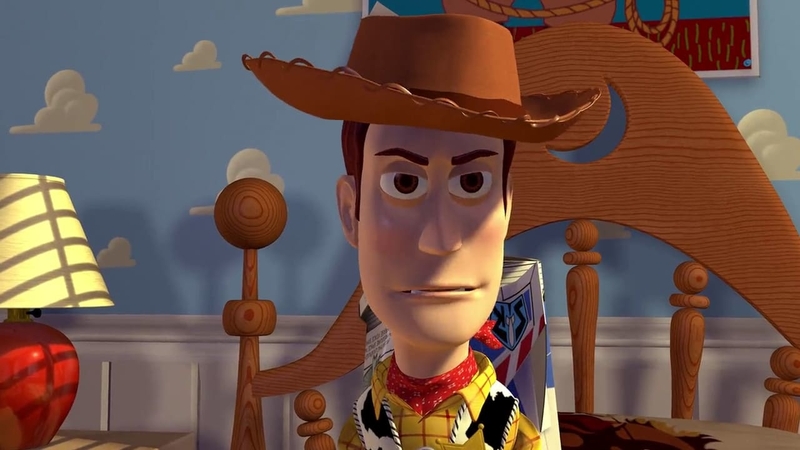 With Woody, an audience becomes personally familiar with the plight of someone not engaging in “playtime.” This lack of activity ripens any self-esteem issues a toy could possibly have and turns the conflict with Activity on its side. Whether it be a problem with who they are, what they do, how they think or what they think, the Main Character gives writers the opportunity to explore conflict on a personal level. This unique quality, separate from the story-wide problem found in the Overall Story Throughline or the relational conflict found in the Relationship Throughline, draws an audience into a story. Without this unique perspective on conflict and the struggle to resolve it, the audience sits apart from the work in question, unable to emotionally invest themselves in the events on-screen or in type. Consider recent emotionally-bereft pieces like Captain America . This latest disaster from Marvel had the best of intentions with its dork-to-champ story, yet for some reason tossed this personal throughline aside to focus on the silly tale of a red-masked Nazi and his super-weapon. If the authors didn’t want to focus Cap’s story on the obvious Situational conflict (weakling with muscles), they could have at least explored what happens when a superhero goes too far. Could Steve Rogers’ feelings of rejection have motivated him to seek out bullies and proactively seek revenge? Certainly, and focusing his throughline on Problematic Activities would have solved this lack of emotional connection to the film. It would have called for an Influence Character with a Problematic Way of Thinking like Robert the Bruce or Buzz, but that’s an entirely different problem! Regardless, an audience needs personal conflict in order to become engaged with a story. Other vacant emotional tales? Fast Five. The writers didn’t even try, leaving this Summer dud one boring race car sequence after the next. Transformers: Dark of the Moon? Like Captain America’s hero, at least Witwicki started out with some personal turmoil. True, Sam was only looking for a job, but at least it gave the audience something! However, just like Cap, Witwicki’s personal conflict was soon overshadowed by mayhem and Dutch angles. Even Mission Impossible 4: Ghost Protocol, despite its phenomenal performance at the box office this season, failed to give audiences an emotional in to the story. Ethan Hunt’s dare-doing atop the Burg Dubai was beyond exciting, yet without something personal to him for us to grab a hold of, his feats became more spectacle than meaningful. There was an effort to graft something on about his long-lost wife, but the exploration of this problem was so under-developed that the film post-Dubai dragged and plodded through its final Indian act. The fights were exciting, but without a well-defined personal conflict there was little reason to care or become emotionally invested. Is it perhaps reductive to isolate a Main Character’s Throughline to only one area of conflict? Not if one understands the purpose of a throughline in defining the personality of a story. Effective stories reflect the problem-solving process of the human mind. To jump from one area to the next invites a sort of narrative schizophrenia that will only serve to confuse and frustrate the audience. Anything is possible when it comes to art so yes, a writer could scatter the focus of a Main Character across several different arenas. Unfortunately, this sort of frenzied approach guarantees that the final product will not be something relatable except to those demented and irrational members of the audience. Audiences want stories that imitate those thought processes they are already so familiar with. The Main Character’s Throughline gives them that experience of I know exactly how he feels… Anything less and that glowing exit sign becomes more of a lure than the images flickering on-screen.